The Rubell Family Collection (95 NW 29th Street, Miami) opens their new exhibition, "28 Chinese," on December 4th. It was curated after six research trips to China between 2001 and 2012 where they visited over 100 artist's studios. Works include sculpture, paintings, photographs and video installations. Also, after a short hiatus, Jennifer Rubell brings back her annual "breakfast" and this year's theme is "FAITH." Check it out Thursday from 9 a.m. to noon. The collection will be open during AB/MB daily from 9 a.m. to 6 p.m. Works from their recent "30 Americans" exhibition are traveling to New Orleans and San Antonio in 2014, so check your local arts listings. Mansion Nightclub (1235 Washinton Avenue, South Beach) has two big Basel nights with Mark Ronson DJing on Friday, December 6th, and Boy George spinning on Saturday. Tickets are HERE. 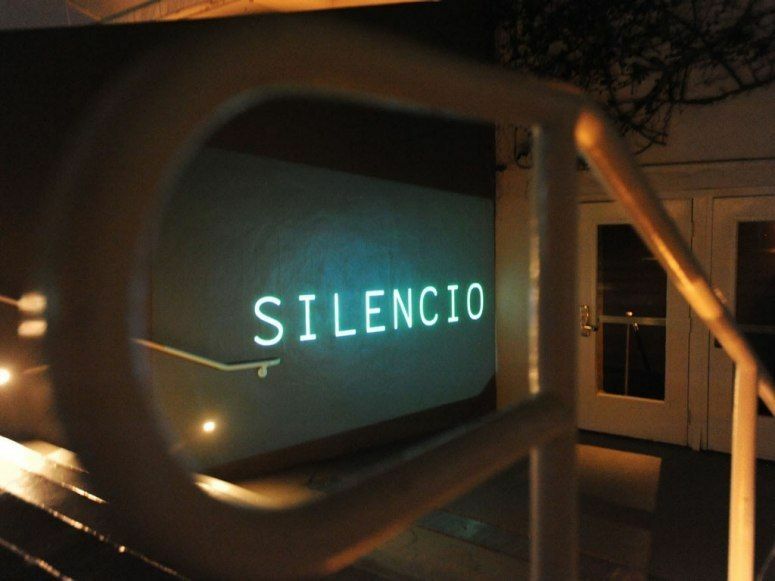 RUMORS: The Parisian club Silencio is back, but will only open as a one-night, pop-up in the Design District and New York's 1OAK will be open nightly as a pop-up in the basement of the Delano Hotel (1685 Collins Avenue, South Beach). Chez Andre (Saravia and Balazs) is open late in the Gale Hotel's Rec Room on December 4th to the 6th. Also, there are lots of rumors floating around about the old ballroom/theater at 5445 Collins Avenue, Miami Beach. The spot was last seen in the film version of Rock of Ages, and we have heard rumors for weeks that Suzanne Bartsch, Lenny Kravitz and Lady Gaga are all doing different nights up there during AB/MB. Dom Perignon celebrates their limited edition sculpture by Jeff Koons at Wall at W South Beach (2201 Collins Avenue, Miami Beach) on Thursday night with music by Zoe Kravitz and DJ Ruckus. Alex Dellal, Stavros Niarchos and Vito Schnabel host. There's another Dom Perignon/Koons party on the 4th at the W hotel for the luxury watchmaker Roger Dubois hosted by Gerard Butler. VIPs only, we guess. Miami gallery Primary Projects is relocating to 151 NE 7th Street downtown on December 2nd, and they're showing new works from Kenton Parker until January 24th. The opening reception is December 6, 6 to 10 p.m. The first phase of a major new development from the Buenos Aires-based Faena Group is coming to Miami in late 2014. Eventually there will be a luxury hotel, an arts and cultural center, a park, artist residences, a marina and oceanfront residences. During AB/MB 2013 there's a little sneak-preview called the Faena Collaboratory at Collins and 32nd Street in Miami Beach, with installations by Argentine artists Juan Gatti and Manuel Ameztoy and the Antwerp-based collective Studio Job. Art Miami -- now in its 24th year -- returns to Midtown Miami in the Wynwood Arts District from December 3rd to the 8th. They're bringing back their CONTEXT fair in an adjacent pavilion along with an Art Video Lounge curated by LaRete Art Projects, plus several solo installations and a special section with six galleries called Art From Berlin. A VIP preview on December 3rd, 5:30 to 10 p.m., benefits the new Perez Art Museum Miami. NOWNESS, Art Production Fund and Suzanne Geiss celebrate the release of a new film by Adam Dugas and Casey Spooner called "Dust," starring Cody Critcheloe, Peggy Noland and Jaimie Warren, on Thursday evening at the Mondrian (1100 West Avenue, South Beach). RSVP only. Adidas sponsors. Miami artist Alexander Mijares opens a show of new works called "Random Acts of Art" on Friday, December 6, 7 to 11 p.m. at 10 NE 27th Street, Miami. One of the works on view will be a mural that will eventually wind-up in the Brioni boutique in Bal Harbour. The opening is hosted by DETAILS Magazine. The KIWI Arts Group has a group show opening on Thursday, December 5th, at 91 NE 40th Street, Miami, with works using Google Glass by David Datuna; photos of Robert Indiana and Andy Warhol by William John Kennedy; and celebrity portraits by the Hilton Brothers (Christopher Makos + Paul Solberg). There's a private screening of Spike Jonze's upcoming film "HER" on December 5th with a Q&A with Jones moderated by Jeffrey Deitch. Porsche Design unveils their "creative collab" with French artist Thierry Noir -- "the first street artist to paint the Berlin Wall" -- at a private party co-hosted by Interview Magazine on Tuesday. The CIFO Art Space (1018 North Miami Avenue. 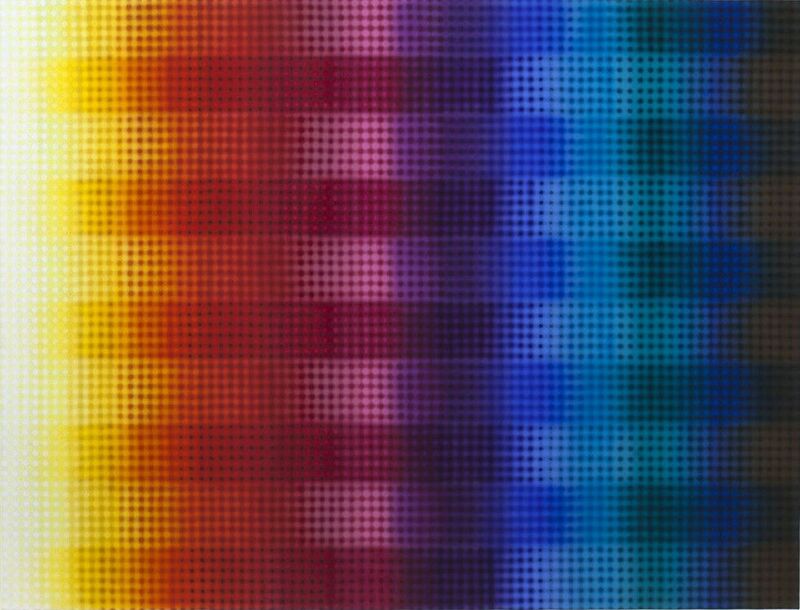 Miami) is opening a big exhibition of contemporary Latin American artists from December 4th to February 23, 2014, It is a partnership with Boston's Museum of Fine Arts, where the exhibit will move and be on view from March 19th to July 13, 2014. 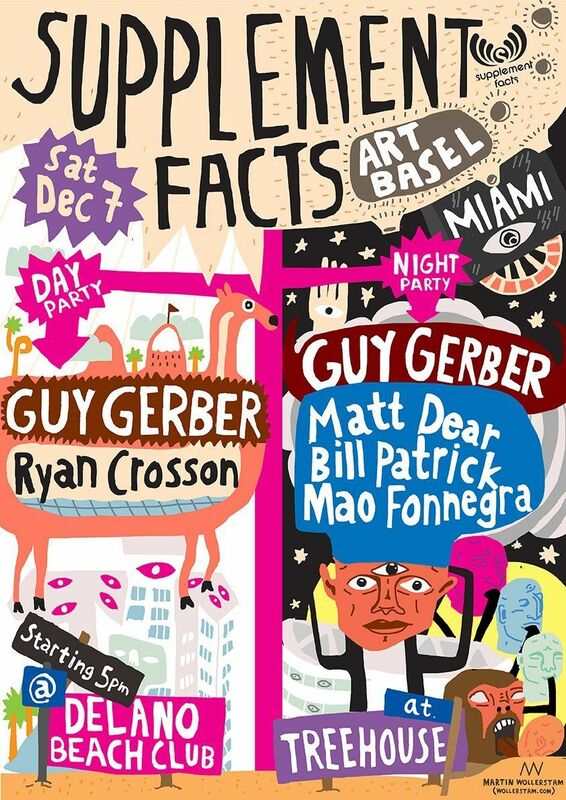 Cool sunset vibes guaranteed with a party for Guy Gerber's Supplement Facts label at the Delano on Saturday. DJ's on the night include Gerber, Ryan Crosson, Mathew Dear, Bill Patrick and Mao Fonnegra. Visionaire and Gap host a private "Tees & Tea" brunch on Friday to celebrate the launch of a t-shirt collab that will eventually include 45 designs. They are only making a limited edition of 300 of each shirt, and the first five are by Yoko Ono, Inez & Vinoodh, Maurizio Cattelan & Pierpaolo Ferrari, Craig McDean and Salvo Sundsbo. Pick one up at The Webster (1220 Collins Avenue, South Beach). David Colman's "participatory performance piece," "The Santa Confessional," happens on December 3rd and 4th in the Collins Park Rotunda. We hear that somebody is planning to shoot a man out of a cannon behind the Soho Beach House (4385 Collins Avenue, Miami Beach). at midnight on December 3rd, following the annual White Cube bash. Any volunteers? Cool group show with works by Stephen Powers, Aaron De La Cruz, Christopher Derek Bruno, Ben Eine, Kenji Hirata, Patrick Martinez, Roids MSK and Otto Zitko on Wednesday, December 4th, 6 to 10 p.m. at 3250 NE 1st Avenue, Miami. 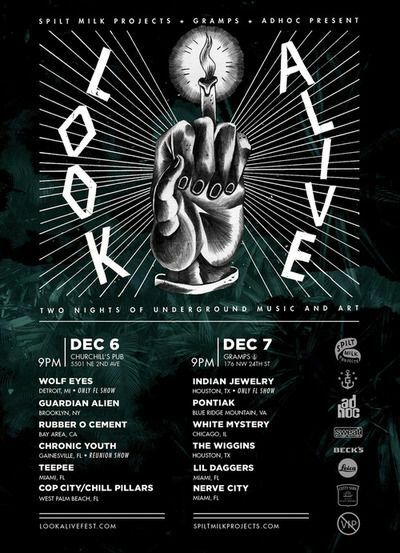 The Look Alive Fest on December 6 & 7 features tons of underground music -- including Wolf Eyes and Indian Jewelry -- plus art, at various locations. All the details are HERE. ArtCenter/South Florida (800 Lincoln Road, South Beach) is showing a new site-specific installation. called "Between Walls" by Spanish artist Juan Lopez. Loft Spirits, Strongbow Hard Cider and Perrier host a four-night, "cocktail experience" from December 5th to the 8th, 8 p.m. daily, poolside at the Surfcomber Hotel (1717 Collins Avenue, South Beach). They've got DJs including Pat Mahoney, Edwin Adams, Amir Abdullah and Karl Injex; plus art from Miguel Paredes, Radcliffe Bailey, Jesse Light, Ruchu Tu and Joshua King. Chloe Norgaard and Nur Khan host a cocktail party for Poplipps and Vs. magazine on Friday night at the Townhouse Hotel. RSVP only. The Cassina Showroom Miami (3800 NE Miami Court, Miami Design District) debuts their new LC4 chaise-longue developed as an homage to French designer Charlotte Perriand on Thursday, December 5th. RSVP required. 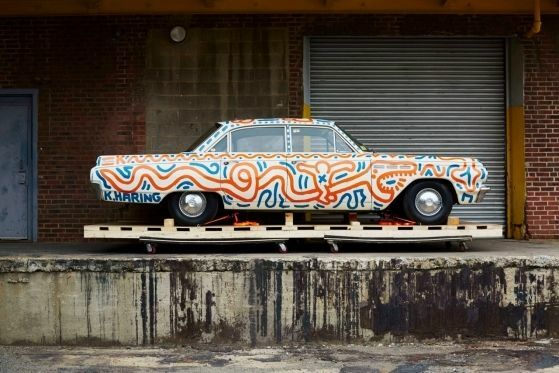 The big "Piston Head: Artists Engage the Automobile" exhibition curated by New York gallery Venus Over Manhattan has its VIP-only opening on Tuesday, December 3, at 1111 Lincoln Road in South Beach. Chicago's "Bad At Sports" art-news blog and podcast will operate an internet radio station in the restrooms of the PULSE fair. UK artist, composer and filmmaker Michael Nyman will be showing his multi-screen video/film "NYman with a Movie Camera" from December 5th to the 8th at 2301 North Miami Avenue, The opening is on the 5th from 5 to 8 p.m.
Pop-Up Piano returns to the streets of Miami during AB/MB. This year, they are giving the funds raised to the Guitars Over Guns Organization. Ocean House (125 Ocean Drive, South Beach) is showing new photos by Amber Arbucci. MCM and Harper's BAZAAR celebrate "Beyond Snowdome: The MCM Collection by Craig Redman & Karl Maier" at the Soho Beach House (4385 Collins Avenue, Miami Beach) on December 4th. Invite only.